Modern flavor from famous brand Lobo, manufacturer of a wide range of excellent quality spice mixes (see below). Just add 3/4 cup water then boil to create a delicious Thai sweet and sour sauce. The sauce is very piquant sour and sweet at the same time, not spicy at all. Spoon over steamed rice, vegetables, and/or the meat of your choice. We like it with chicken, pineapple chunks, onion and green bell peppers. Ingredients: sugar, corn starch, vinegar powder, tomato powder, hydrolyzed vegetable protein (soybeans, maize, maltodextrin), msg, citric acid, spices, salt, tricalcium phosphate, silicon dioxide. No artificial color or preservatives. One package makes about 8 servings. The package contains a recipe for sweet and sour chicken, suggesting you prepare the chicken first with Gogi tempura powder. 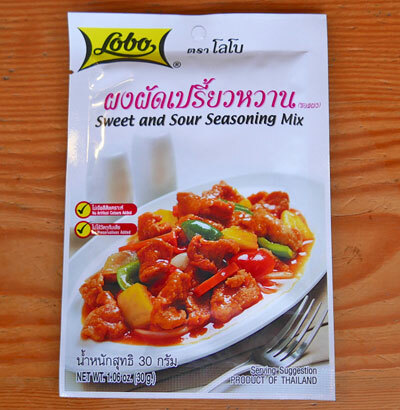 Here we show you how to make a delicious big meal using one packet of Lobo brand sweet and sour mix.